Wales coach Warren Gatland says England prop Kyle Sinckler can "emotionally be a bit of a time bomb", but says his side will not target him in Saturday's Six Nations showdown in Cardiff. Harlequins forward Sinckler, 25, has been involved in controversial incidents during the tournament. "I am not saying anything that people aren't aware of," said Gatland. "We won't be going out there trying to antagonise him, because that's not in our make-up." Gatland added: "We will just go out there and play." During England's win over France, Sinckler was reprimanded by Welsh referee Nigel Owens and reminded of "rugby's values" after slapping Arthur Iturria's head. 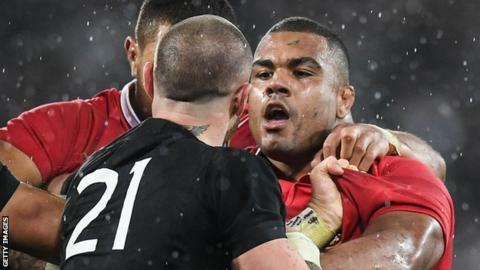 Gatland coached Sinckler on the 2017 British and Irish Lions tour to New Zealand and says the forward is aware his temperament can be an issue. "There is no doubt he's a very good player in terms of his carrying, scrummaging and work rate," said Gatland. "There is a challenge sometimes with his temperament. He's aware of it. Other players are aware of it. We've already seen in the Six Nations that he has been involved in a couple of incidents. "Hopefully we don't get dragged into that on Saturday. "Hopefully he goes out and has a good game and is able to keep his emotions in control, because that's a big challenge for him." Sinckler acknowledges he was at fault in his altercation with Iturria but says television cameras did not provide the context to the incident. "I don't condone what I did, but they didn't show the full replay of what actually transpired," he said. "I didn't just smack him on the head. There was stuff that happened before. I am not perfect, and I have learnt from it." Gatland has underlined his players' need to keep their cool in what promises to be a highly charged atmosphere. "It's going to be incredibly physical with a lot of passion involved. Discipline is going to be paramount. "I want my players to bring that physicality and be emotional, but I don't want them going over the top, losing their edge or getting involved in foul play. "One thing I can't stand about the game is foul play. We want to play tough and hard, bring as much physicality as we can, but playing to the laws of the game. "This has become a really big game for both of us, not so much for the Six Nations, but building for the rest of the year - World Cup plans for Japan." "Win this game and I think it sets you up mentally as much as anything for the rest of the year."